lizzy write: . . .
At that age they don't care about color. Only that it is mobile. If it has wheels... it's a 'boy toy'. He is so stinkin' cute! Until I read Cheryl's comment I hadn't noticed the girl bike.. only the adorable little face! Oh my I totally see his mama in this pic... very cute! 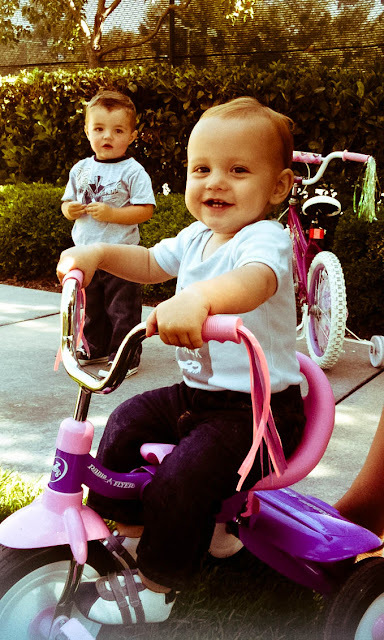 he's big enough to be either riding on or posing as riding on a trike--impossible! Little red is growing up. Tell me you are staying at the boutique hotel On The Avenue. Beth recommended it to my sisters and I when we went to NYC a couple of years ago and we L.O.V.E.D. it. don't forget to check out the temple! Where did you get his awesome shoes! ?